If you are anything like me, you treat your dog like a family member. Just like us, our canine companions love having a comfortable bed of their own to cuddle up in, sleep, or to simply escape the worries of the world for a little while. Ensuring your pup has a nice dog bed will keep them happier and safer, as well. The process of finding the best bed for Fido can be a stressful task, partially due to the plethora of available shapes and sizes. Figuring out which dog bed will work best can be a time-consuming chore. 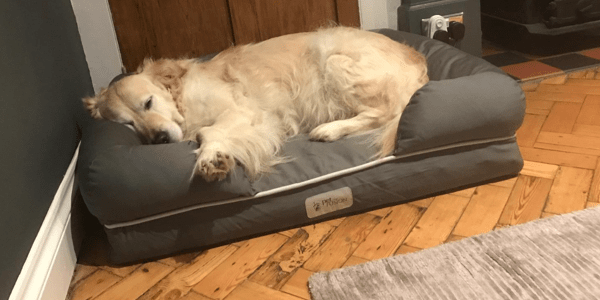 To help demystify the process, we have tested and reviewed ten of the top pet beds for your pampered pooch. We have also created a buyer’s guide that will assist you to find the best option for your furry friend faster than you can say fetch. 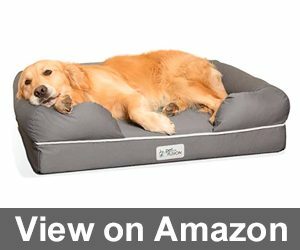 Does My Dog Need a Pet Bed? 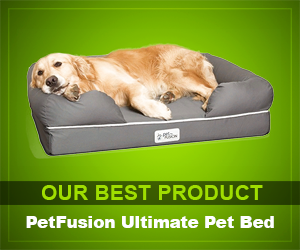 The PetFusion Ultimate Pet Bed is a very solid and supportive choice for your dog. The bed is composed of memory foam and is also filled with recycled polyfill to maximize comfort. The bed also features a waterproof liner which is a terrific way to keep the bed clean and fresh. 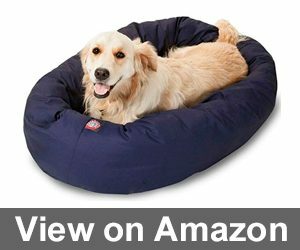 The PetFusion Ultimate Pet Bed offers exceptional head and neck support. The sides are soft enough to burrow into for comfort while also being sturdy enough to hold up wonderfully to rougher doggies. 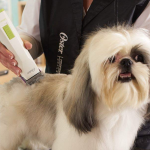 The cover is crafted from a breathable poly-cotton blend which is perfect for pups with sensitive skin. The BarksBar Gray Orthopedic Dog Bed is a wonderful option for medium to larger sized breeds or several smaller pups. The bed has a maximum weight capacity of over 100 pounds, so you won’t need to stress about whether your fur baby will fit comfortably. This option is also safer than other choices thanks to a non-slip rubber mat on the bottom of the bed, which will help to prevent accidents. 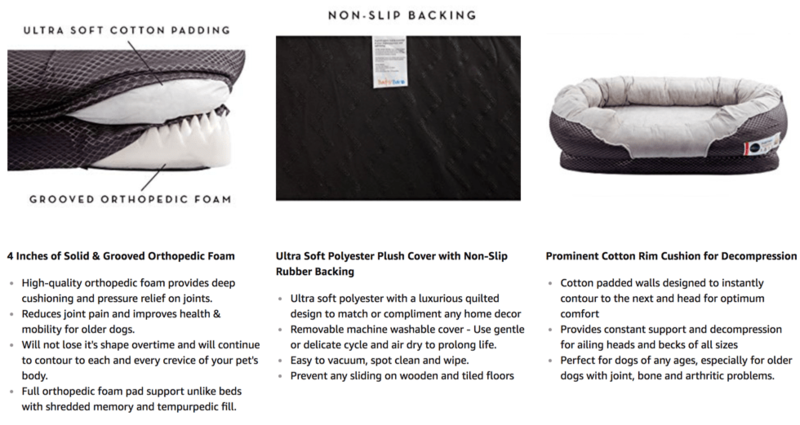 The BarksBar Gray Orthopedic Dog Bed features a solid orthopedic foam base to alleviate pain from aching joints, arthritis, and other mobility or aging concerns. A super comfortable padded rim contours to your pet’s body instantly to provide support and reduce pain. Our testing team loved this bed for their senior dogs since it is so soft and incredibly supportive for arthritic joints. The Big Barker 7″ Pillow Top Orthopedic Dog Bed has been specifically crafted for big dogs like Rottweilers, Dobermans, or Great Danes, for example. While this bed is pricey, it features a ten-year warranty. This option has a seven-inch therapeutic foam base to comfort and protect your big pup. The Big Barker Bed is guaranteed to keep its shape which is no small feat for larger breeds. 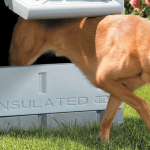 The foam used in the construction is of a much higher quality than similar versions so dogs with aching joints or arthritis will be thrilled with their new resting spot. One member of our testing team noticed an almost overnight improvement in the mobility and pain levels in her Great Dane making this a great choice for bigger pets with pain issues. 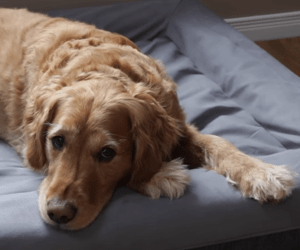 The Cozy Cave Pet Bed by Snoozer is one of the cutest designs we tested. This bed features a Sherpa interior to provide maximum warmth and comfort. The bed has a hood piece that allows you fur baby to burrow in deeply for extra security. 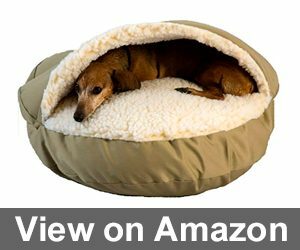 The Snoozer Cozy Cave Pet Bed in Poly Cotton is a wonderful choice for pets with anxiety. They can hide within the “cave” which is comforting during storms or when they miss their owners who are at work. Our testing team loved watching their pets dig into the cave and noticed it was perfect for calming a pet during thunder and lightning. 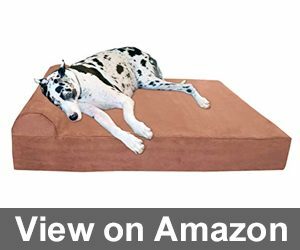 The Dogbed4less Overstuffed Orthopedic Dog Pillow has been created with a pillow cushion style bed in mind. The bed is composed of shredded memory foam which forms to your pet’s shape for maximum comfort and warmth. The bed also has a ten-inch orthopedic insert to offer support for larger breeds up to 160 pounds in weight. This offering from Dogbeds4less has two layers of covers. The inner layer features a breathable internal cover that is waterproof. The outer cover has been made from micro suede which will be warm and is extremely easy to keep clean from stains. The Serta Deluxe Ortho Quilted Couch Pet Bed received some the highest marks of our testing team. The bed is crafted with four inches of Serta’s advanced ortho egg crate foam. 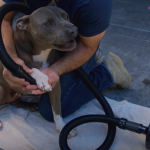 This is the same foam used in their products for people, so your furry friend will be sitting in the lap of luxury. This offering from Serta features a raised side on the back and sides which will offer neck and head support while giving burrowers and security seekers a nice place to relax. The front is open to allow dogs with mobility issues easier access and letting sprawling dogs have room to spread out. Our testing team loved the Serta couch bed almost as much as our pets did thanks to its ease of cleaning and overall comfortable feel. The Majestic Pet Bagel Dog Bed is an extremely appealing option thanks to its bagel-like design that almost envelops your pet. The bed features a waterproof base made from denier fabric. This type of fabric holds up extremely well to the abuse of hyperactive pets beautifully. Tour testing team loved the price of the Majestic Pet Bagel Dog Bed and noted that it is incredibly durable. The bed is filled with a premium polyester fill to provide support and comfort. The bed is also completely machine washable, so you won’t need to disassemble it. 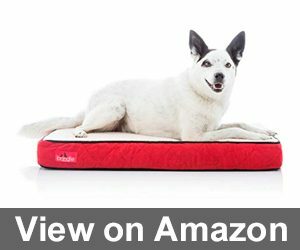 The Furhaven Pet Dog Bed is a couch style orthopedic bed. The bed has been created with an orthopedic egg crate foam base that provides support and comfort to pets with arthritis or other pain issues. This bed is offered in four sizes and several color options as well. The Furhaven Pet Bed has a machine washable cover to keep your home and pet cleaner. The cover is quilted and extremely soft on paws and noses. Our testing team was thrilled with both the price and performance of this offering from Furhaven. 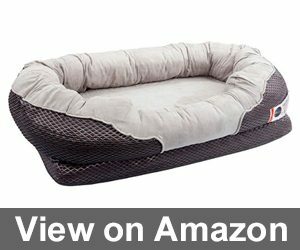 The Brindle Waterproof Designer Memory Foam Pet Bed provides a cozy and soft spot for your furry friend to rest. The bed features a two-inch high-density foam layer that is topped with another 2-inch layer of orthopedic foam. The cover is easy to remove to wash in your washing machine. This offering from Brindle is a terrific choice to place inside of crates. The orthopedic foam will softly cushion your dog’s joints to alleviate pressure and pain. The bed comes in small, medium, or large and is available in several colors. The Coolaroo XL Elevated Pet Bed offers an elevated, cot style option that is perfect for outdoor-based pups. The bed has a breathable fabric that will work wonderfully for temperature regulation in nearly any weather. The fabric has been UV treated to halt fading from the sun’s rays. The Coolaroo Elevated Pet Bed accommodates canines up to 125 pounds in weight. This would be an excellent choice for the biggest of breeds including Great Danes or Irish Wolfhounds. 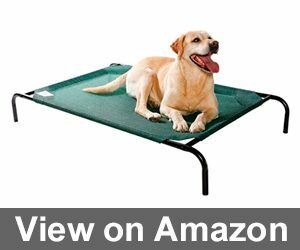 The bed will keep your pet elevated and away from freezing grounds, snow, rain, bugs, and more. You may be tempted to just let your pup sleep in bed with you. Or maybe they like to sleep on the floor or your couch. However, a dog bed can provide your furry friend with more than just a good nap. A cozy sleeping spot gives your pooch a calming sense of safety and security. If they are feeling anxious or scared, they will have a special little spot just for them. Canines are territorial pack animals by nature, so a dedicated sleeping spot will certainly be appreciated by your pup. Your pet’s new bed will be more comfortable than sleeping on the floor, for example. The ground is cold and hard. A soft and cozy bed will provide comforting cushioning and insulation to keep them warm. A pet bed will also help to protect your home from dirt, fur, and dander away from your bed or couch. This can be extremely helpful if you or a loved one have allergies or asthma. By using a dog bed, you will be keeping any potential allergens safely at bay. Let’s take a closer look at a few necessary items to think over when shopping for a pet bed. If you haven’t measured your furry friend recently, now is a perfect time. Knowing your pet’s size makes finding the right bed much easier. You should also think about your pet’s activity level. For example, hyper dogs with a lot of energy are better suited to a bed with sturdier construction and a durable cover while a smaller pup may like a little, fluffy option. Spend a few moments watching your canine companion as they sleep. Some dogs like to sleep curled up into a tiny ball. Some like to stretch out with each leg pointing a different way. Understanding how your pet feels most comfy while sleeping will enable you to select a bed that suits them and their sleeping style perfectly. Money matters, so it’s important to know your budget. Dog beds can be priced anywhere from inexpensive, basic versions to grand, costly ones. You can find them in nearly any size, shape, color, and texture to complement any home and decor. When searching for the best dog bed for your faithful furry friend, it is helpful to understand the various types of beds available. Just like beds meant for humans, doggy beds come in many different shapes and sizes that suit different needs and preferences. Let’s take a closer look at the different models. This style features a round or oval cushioned base. The sides on a donut and bolster beds are raised and provide a wall for your pup to lean against or burrow into. This type of bed is great for neck and head support, calming anxiety in pets, and offering a sense of security. Don’t and bolster style beds are terrific for toy and smaller sized breeds such as Chihuahuas, Pomeranians, and Corgis, for example. The bed helps to retain their body heat, keeping little pups warm and comfy. Just be sure to check that your dog can get over the raised sides easily or pick an option that has a spot with no wall for entry. An orthopedic bed is the perfect solution for aging pets. Just like us, as canines age, they might experience joint pain and arthritis. This type of bed offers extra support to cradle your pet gently. An orthopedic bed is also a great choice for dogs on the thinner side since it will protect any bony prominences while protecting painful pressure points as well. An orthopedic dog bed is also wonderful for larger pats. Dogs can sprawl out comfortably thanks to the oversized, roomy shape that they are typically designed with. Homes with smaller dogs can also benefit from this style since it can accommodate several smaller pets at a time. A pillow cushion style bed is perfect for animals that enjoy sleeping while fully stretched out. 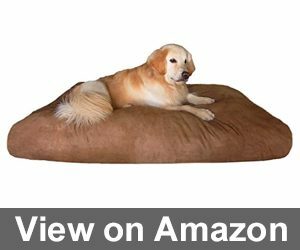 The design looks like a large pillow, so it is also a smart choice for pets with mobility concerns. You can easily find or make an extra cover for this type of bed to prolong its life if needed to extend its life or match your interior decorating scheme. If your pup has arthritis, is older, is thinner, or seems cold often, then a heated bed may be the best option. Painful joints are soothed in minutes thanks to a heating system much like a heated blanket. 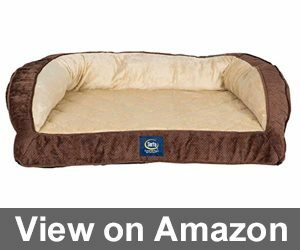 Smaller canines will also love this bed since it is often difficult for them to regulate their body temperatures, especially in the winter months. If you have an outdoor dog, then a cot style bed may be perfect for you and Fido. Cots beds are elevated off of the ground or floor. This is important in the winter when the ground can freeze. It will also keep them warmer and dryer as well. Dog beds can get gross pretty quickly without a bit of routine maintenance. Your best bet lies in selecting a pet bed that includes a removable, washable cover. You will want to wash it on the delicate or gentle cycle. Be sure to double check any manufacturer’s directions to keep the cover in tip-top shape. If your dog is a hider, you will also want to shake the bed out to remove food, hair, and whatever items they may have hoarded away. You can extend the life of your dog’s new bed by throwing an old blanket or towel on top. Remember to put the rest of the bed somewhere safe during cleaning as getting urine or dirt out of memory foam or padding is not a fun way to spend an afternoon. A cot style dog bed is also great during adverse weather. It will elevate and protect your pet from snow or rain. Most cot beds are created with a waterproof fabric to add extra longevity and to protect your pet. When you are looking for the best dog bed for your fur baby, it’s important to observe how they sleep and keep any health conditions such as arthritis in mind. There are many amazing beds that can alleviate pain, increase mobility, keep your pet warm, or even help their separation anxiety when you are at work. Understanding your faithful friend’s specific needs is the best step toward picking the best bed. 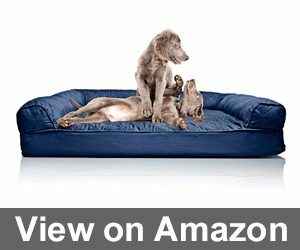 We hope you had fun learning about the best pet beds available and reading through our reviews of the best dog beds. Hearing back from our reader’s is always a bright spot for us, so please drop us a line below. We would love to hear about you and your pup’s favorite beds and any tips you might have. I like the idea that there are long-period warrants on animal products because you never know which condition will be after a few months of usage. So my choice was The Big Barker 7″ Pillow Top Orthopedic Dog Bed as my dog is quite big. And I’ve been using this bed for about a year and it still looks good. I understand why Big Barker 7″ Pillow Top Orthopedic Dog Bed is an editor’s choice. This bed has been working for my dog for about half of a year, but I can already say this is the best option for its price. My dog excited with Serta Deluxe Ortho Quilted Couch Pet Bed! He spends there so much time and sleeps so well so I can’t leave this website without leaving a comment. Recommend to everybody who’s tired of your dog’s activity and wants to calm down him or her a little bit. I use the same dog bed and can’t say anything bad about it. it’s really a good option! My dog likes walking in prohibited places and she’s always dirty somewhere, that’s why I needed a dog bed which is easy to clean. My choice was The Dogbed4less Overstuffed Orthopedic Dog Pillow and I have no regrets about it. It’s comfy and doesn’t cost much. I don’t know what to say about dog beds. Serta Ortho Quilted Couch Pet Bed looks quite comfortable for my dog. I like that this bed costs not very much. I have only one thing to look at while choosing any presents for my doggo – whether it’ll be easy to clean it or not. My little friend ruins everything I bring to the house, that’s why I make choices very consciously. I repeat to all my friends: always look at the warranty when you buy presents for your dog. The last dog bed that I bought had a ten-year warranty which saved me a lot of money. Dogbed4less Overstuffed Orthopedic Dog Pillow is very comfy and easy to clean, that’s why I’ve been using it for more than a half of a year. Recommend to all dog owners! I like that Majestic Pet Bagel Dog Bed By Products is waterproof and washable, so these facts are the most important for me. I’ve bought it a few months ago and since that time I haven’t noticed any problems. My dog likes this bed very much!